Austin International School’s outreach coordinator, Sharon Munroe, and school staff member Suzanne Krause join forces in this guest post to let you know that AIS kids learn much more than language and culture. One of the subjects AIS takes very seriously is science—so much so that it dedicates an annual night of fun to it. When you think of science events at elementary schools, what do you think of? For many parents and students, it means creating an original science project or invention for a fair on a deadline, often with the parents doing a lot of the work and getting stressed out the night before it is due. At Austin International School, we take a different approach. At our second annual event, held on March 26, students in Kindergarten through fifth grade experienced science at hands-on activity stations that allowed them to play with sights, sounds, and smells; be physical; make observations; and solve puzzles. The approach was inquiry-based, hands-on, fun, and educational all at the same time. Our teachers found inspiration for the project in collaborating with our partner elementary school in France, and then we made it our own. Family Science Night is one aspect of the international educational exchanges that regularly occur in our unique learning environment. “Family Science Night is designed to be a special event where elementary-age children and their parents truly have fun, and we promote science learning together as a community,” explained Cedric Herve, Austin International School teacher and science night coordinator. “Why does the egg float?” has become one of the most popular stations. Involving water, salt, bowls, and eggs, it lets students get a bit messy and keeps them entertained and curious until someone at the table can solve the mystery. To explore the five senses, students tried matching the ringing of a hidden bell with a choice of bells before moving on to a series of herbs and food to smell and taste. Some classes had a quiz table with trivia about odors and the noses of different birds and animals. Older students guided their younger friends by explaining the activities and purpose of each station. With parents and children working together at stations, the setup provided for an engaging atmosphere where kids could experience science outside the classroom. Parents were actively participating with groups of children too. This helped students to see that science happens everywhere, every day. It fostered interaction among parents, children, and teachers with a fun, educational experience that surpassed the benefits of simply doing homework or a project. Hypothesis: Holding an annual Family Science Night will build students’ confidence to understand science and to experience its wonders in a holistic way. A stimulating educational activity outside the regular school day will help families come together to learn outside the regular school day. Conclusion: Our observations showed that Family Science Night does indeed foster a curiosity about science and the hidden world around us. Our students sought to educate themselves and guide their schoolmates on their educational journey. They inspired (and will continue to inspire) each other, their parents, and themselves to discover, imagine, experiment, and take risks. This is an annual tradition for the Austin International School community worth keeping. How do children as young as three learn in three languages? Sharon Munroe serves as outreach coordinator at Austin International School, where her own children happily learn in three languages. In this guest post she explains how the school’s unusual model works. It is possible for young children to be educated in three languages, even if they have only spoken their native language prior to starting school. In fact, this is both the philosophy and the practice at a unique preschool and primary school called Austin International School located in Northwest Austin. I have seen it myself, both as a parent of young children and now working at the school on the outreach team. AIS began like many international schools around the world. 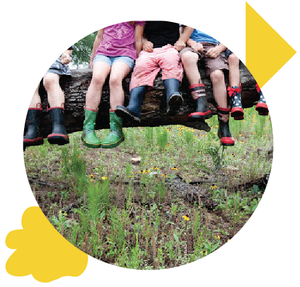 Founded in 2001 by French nationals seeking to keep their own children immersed in French language and culture during their time in Austin, the school has evolved into one serving both local families and those from as many as 20 different countries, making a very diverse community of learners. Students from all ethnic and cultural backgrounds learn in French, English, and Spanish through immersion with native speakers who are experienced teachers. 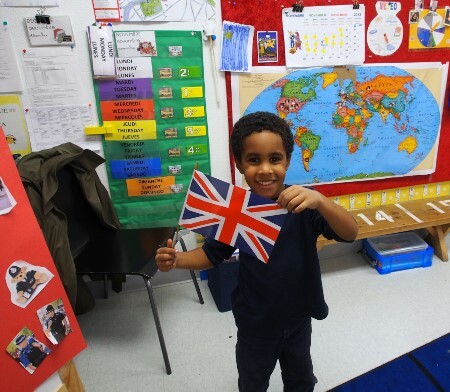 There is no language prerequisite for entering pre-kindergarten or kindergarten at Austin International School. I walk into a Petite Section classroom designed for three-year-olds, and they are singing “Head, Shoulders, Knees, and Toes” in English. Four-year-olds down the hall are painting outlines of bodies, drawing in the heart and lungs using Spanish vocabulary. Kindergartners are dancing with their native French-speaking teacher in the multipurpose room. Fourth graders in the Science Lab are having a lesson in French about organs and how the heart and lungs work in humans. The curriculum is not the juxtaposition of three curricula (one French, one English, and one Spanish); instead, it is one unified curriculum in three languages that includes all subjects. It builds on the core learning from year to year, based on the French Baccalaureate curriculum. 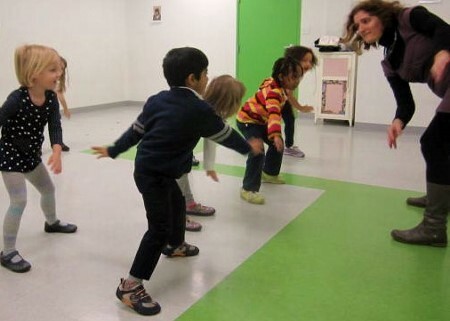 In the unit of inquiry on the human body, all students in pre-kindergarten and kindergarten learn vocabulary and the science behind their bodies, incorporating art and music in their classroom as well as physical education instruction. Over three weeks, they learn all of the age-appropriate information from three teachers who come to their classroom on a rotating basis throughout the week. The seamless delivery of the unit allows a dialogue among cultures and languages and develops critical thinking skills. Yes, it happens in children as young as three. The international faculty leads by example by always working collaboratively. For a typical kindergarten class, a team with a teacher from the United States, France, and Mexico are a classroom team. Each teacher brings his or her personal background, culture, and professional expertise to deliver the best learning experience possible. Each week when school is in session, they spend at least three hours as a teaching team, planning the units of inquiry and daily lessons and discussing both the needs of the class overall and of individual students. Where one child may need extra support in one language that is new to him, the same child may need to challenge his vocabulary in his native language. “Fundamental language skills develop in all three languages simultaneously; however, some skills are language specific. Communication between teachers is critical to ensure that students are successful and that we meet their needs in each language,” according to Carol Shay, who joined the first grade teaching team in 2012 after many years in Austin’s public schools. An assistant teacher helps and nurtures the children alongside each team of three classroom teachers. These vital staff members support the children’s needs both in the classroom and on the playground. Teacher-student ratios are intentionally low to provide support to all learners from preschool through fifth grade. Many young children are ready to learn at age three in a full-day school environment. They are able to learn a great deal from their classmates and teachers; they see and hear the differences among their schoolmates, who come from many different countries but all now live in Austin, a microcosm of the world. This is the start to their global citizenship. Austin International School graduates go on to many of the area’s top middle schools—public, charter, and private—and thrive in all settings. One recent graduate, David, who began in kindergarten with no prior background in language or culture beyond his own (as an English-speaking American), has been recognized as a “connector” and won a sixth grade leadership award at St. Stephen’s Episcopal School. Other students are learning a fourth language and excelling in advanced math and science. They are well-rounded young people. Most come back weekly for the Alumni Club activities held on campus. I have seen the progress of the school, the students in general, and my own children over the past four years. Austin International School develops global citizens and critical thinkers. For more information, please visit austininternationalschool.org or contact me at outreach@austininternationalschool.org.